Diego Maradona has denied threatening to quit as Argentina coach. Maradona, whose team are in real danger of missing out on the World Cup, seemed to cast doubt over his future in a news conference on Wednesday. But the 48-year-old said the media had misinterpreted his comments about meeting Argentine Football Association (AFA) president Julio Grondona. "I'm not giving up nor am I going. I never said I could resign. I'm asking the media for some respect," he said. "I only said that after the qualifiers I had to meet with Grondona about what has happened this year. It was you (the media) who said about resigning." Maradona was appointed by the AFA in November 2008, but four defeats in his 10 games in charge have left Argentina in fifth place in the South American qualifying group with two games to play. The top four teams qualify for the World Cup while the fifth-placed team enters a home-and-away play-off with the fourth-placed team from the North, Central America and Caribbean region. Argentina's final group games come against bottom of the table Peru on 10 October and sixth-placed Uruguay on 14 October. Maradona was recently quoted as saying: "When Grondona called me to his house and offered me the job, I told him I was the happiest person in the world. "But after that things happened that I didn't like and I will speak about them later. "If I continue it will be under my conditions. After the qualifiers I will talk to Julio." Maradona, who succeeded Alfio Basile in November 2008, has come under pressure following Argentina's poor run of results - including a 6-1 drubbing by Bolivia in March. Three successive defeats by Ecuador, Brazil and Paraguay have left Argentina fifth in the South American standings and in serious danger of missing out on the World Cup for the first time since 1970. 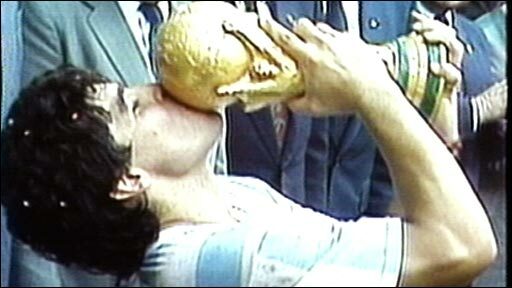 "I see myself coaching in the World Cup," said Maradona, who helped Argentina win the 1986 World Cup finish as runner-up to Germany in 1990. "But I did not expect to be in a position like this. "I played two finals. Those were the most important games of my life. But I suppose as a coach, these are among the greatest (matches) of my career." Much of the blame has been placed on Maradona, who has been criticised for a perceived lack of team strategy and selection consistency. Although Maradona did not specify his conditions, it is believed that he is unhappy with technical director Carlos Bilardo's interference in team affairs. Local media reports have said the two are barely on speaking terms. 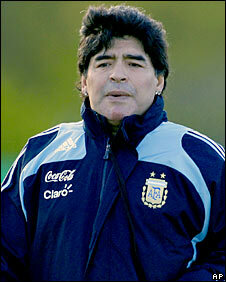 Maradona, though, has blamed his side's predicament on a lack of time spent with the payers. "Keep in mind, they are coming off 14-hour trips and if you don't let them rest - you'll kill them," he said. "I wish we could have them train, have them do plays, work with the ball, but we can't do it like that. "The guys do what they can. One has a muscle problem, another comes in with a swollen ankle. Another has back pain. "You worry that if you push them you won't have them for the game." Peru have never won a match in Argentina and are already out of World Cup contention but they are confident of causing an upset. "History says that we never win in Argentina," said Peru captain Nolberto Solano. "We're going to try and change this. "If we do, Peru will turn into the 'bad guy' in the movies - leaving them (Argentina) out of the World Cup." Brazil and Paraguay have already qualified from the South American group, with Chile almost through, but Ecuador, Argentina, Uruguay, Venezuela and Colombia are all in contention for fourth.